VANCOUVER, BC--(Marketwired - April 08, 2015) - How do you share the real life impact donations have for families living with disabilities? 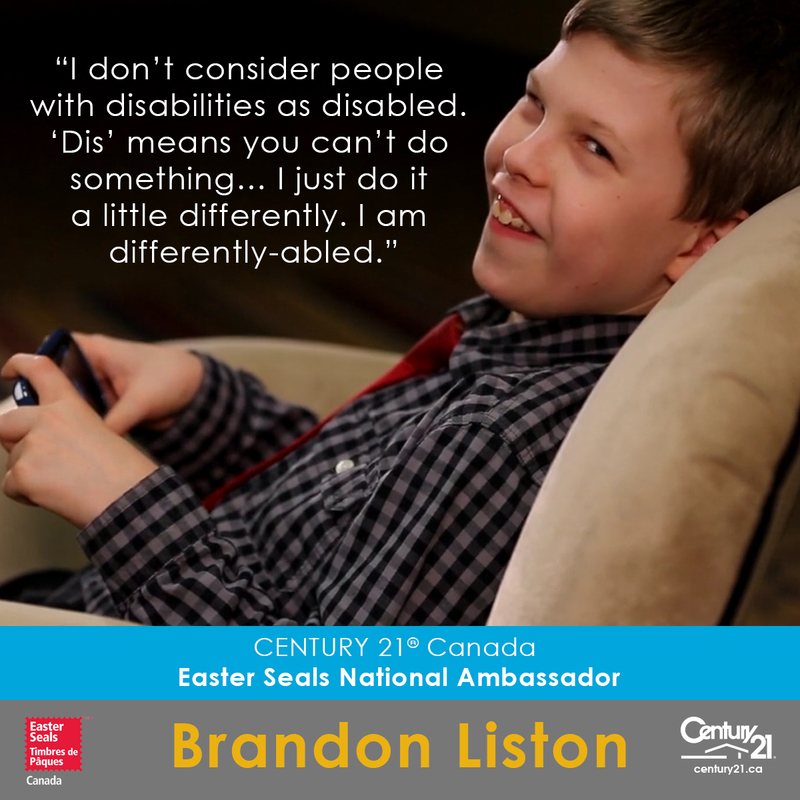 March was Easter Seals' month and CENTURY 21® Canada has enlisted the voice of 14-year-old Brandon Liston to launch the charity's first National Ambassador Program in the country. "The ambassador program has given me so much courage and so much of a start for the future," said Liston. "I don't consider people with disabilities as disabled. 'Dis' means you can't do something… I just do it a little differently. I am differently-abled." At 15-years-old, Liston is an inspiration. He was the youngest recipient of the Rotary Club of Fredericton's Paul Harris Fellowship Award, the highest honour awarded to individuals who show "service above self." He has continued to set and conquer challenges, from tackling public speaking to rock climbing. "When Brandon speaks, everyone listens. His positive attitude and enthusiasm for helping others are contagious," said U. Gary Charlwood, executive chairman, CENTURY 21 Canada. "Who could better share the story of Easter Seals kids? We hope to assist Brandon as he progresses from a young boy with big dreams into a young man who realizes them!" Liston has ambitious future goals, striving to join politics as mayor, MP, or prime minister, or to make kids smile as the CEO of Easter Seals. To hear more of Liston's story, visit the Easter Seals website or watch the ambassador program video. CENTURY 21 Canada is Easter Seals' number one real estate fundraising company and their third largest corporate partner in Canada for total donations contributed. Since 2009, System members have raised nearly $3 million for Easter Seals and the Kids to Camp program. The CENTURY 21 System is the world's largest residential real estate franchise sales organization with approximately 6,800 independently owned and operated franchised broker offices worldwide and over 100,000 sales professionals. CENTURY 21 provides comprehensive training, management, administrative and marketing support for its members in 78 countries and territories worldwide. ®/™ trademarks owned by Century 21 Real Estate LLC used under license or authorized sub-license. ©2015 Century 21Canada Limited Partnership.